The PoCo Garden Club, based in Port Coquitlam, has been digging up support for the Horticulture program at the University of the Fraser Valley since 2001. Fifteen years of generosity has supported the purchase of horticultural equipment. The club’s annual contribution, ½ of the proceeds from their annual plant sale, is made to UFV each year in May (with additional contributions some years). This year’s sale is from 9 am to 1 pm on Saturday, April 30th at Trinity United Church, 2211 Prairie Avenue, Port Coquitlam. 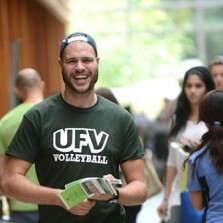 The Horticulture program is part of the Agriculture Department UFV. Horticulture facilities at UFV include North America’s tallest greenhouse, built of translucent polycarbonate walls with three hooped bays. The cladding/glazing/walls are polycarbonate, which is similar price of glass, insulates better than glass, and yields no shadows. It can be programmed for humid or dry atmosphere. The 12 giant fans (from Germany,) are whisper quiet. No sprays are used outside of Safer’s Soap; UFV practises integrated pest management, which the PoCo Garden club has helped support with the purchase of insect research equipment. It is solar heated; at night ceiling fans in long plastic tubes force the heat down to the plants. During winter weather, a natural gas boiler warms water, which is sent in pipes through the greenhouse. Food waste from the UFV cafeteria is composted, put in a digestor, and the resulting compost used in the greenhouse and the berry and vegetable patch. The wall is structured with spaces between the metal studs and the poly panels. It is built to withstand a hurricane situation up to 160 mph winds. All systems are controlled by computers. There are probes to record temperatures for the researchers. In the future, the row chambers (like gutters) will have probes to record CO2, LED lights, changes in temperatures, etc. UFV is experimenting with growing without soil. They now use coco peat which can be composted. The fertilizer injection system was purchase with money from PoCo Garden Club. It is made at 100 times strength and the system dilutes and delivers what is needed for each plant. UFV’s Horticulture Program benefits from PoCo Garden Club’s annual commitment as do UFV students and programs – thanks to the generous contributions of UFV donors and funders.